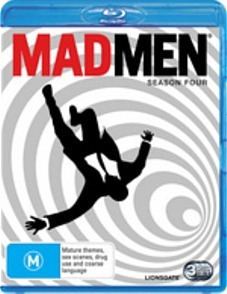 Mad Men Season 4 is set in the late 1960s in the new office of Sterling Cooper Draper Pryce, the agency that was created at the end of season 3. This season involves more of the Vietnam War while tackling social issues that were prevalent within American in the 1960s. Like the previous seasons the focus is on Don Draper’s personal life as well as his life within advertising. This season picks up where the last season left of in terms of his divorce with Betty and her subsequent remarriage. This is a strange television show, so much is going on and yet nothing sees to occur. This is not the type of show that relies on big plot twists for every episode, and while the series as a whole does involve twists, they only seem to exist as ways of furthering each character and to highlight some social morale or event that is particular to the 1960s. This show is as much about character development as it is about developing the audience’s knowledge of the period. Fans of the TV series will want to get their hands on this season as soon as possible, especially since Australia is so far behind America in terms of screening episodes on free-to-air television. For those who haven’t seen this show before there is no point in starting at season 4, the characters have developed so much over the seasons and situations are alluded to and without that wealth of knowledge this season won’t be understood by a newcomer. I have to question why you would purchase this season on blu-ray though as opposed to the DVD as there isn’t a noticeable difference in the quality of the image. The images are not as crisp and clear as one might expect, with some instances of a very grainy image, though I am choosing to believe that this is a conscious decision made by the creators of this TV show in order to maintain the aesthetic that audiences associate with this era. This however makes the extra price paid for the blu-ray disc somewhat redundant. The special features also leave much to be desired. Each disc in this three disc set has a different documentary on it and each one is as boring as the last one. None of them have anything to do with the actual show but rather talk about the 1960s. This might be interesting to you only if you watch the show purely for the decade rather than the characters.